The steps are simple! 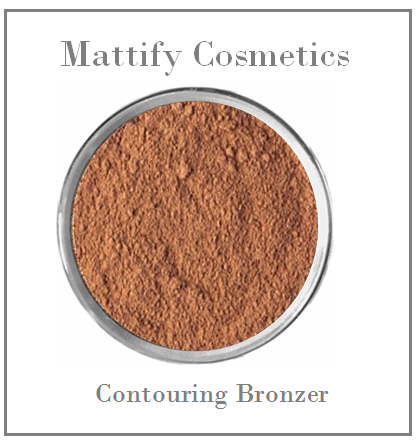 Slim areas of your face that you would rather downplay with application of our Contouring Bronzer. 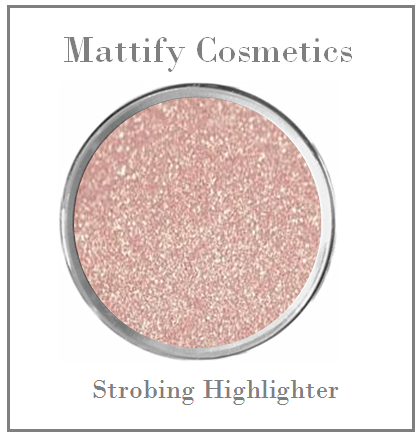 Add a fresh glow to your best features by illuminating certain areas of your face, using our Strobing Highlighter. 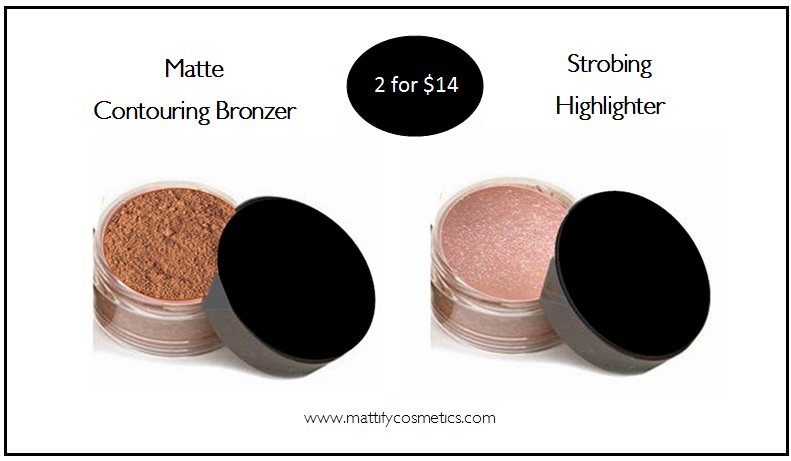 Mattify Contouring Bronzer & Strobing Highlighter are semi-transparent and highly blendable. This is the perfect combo to contour and slim your face, creating a stunning complexion! 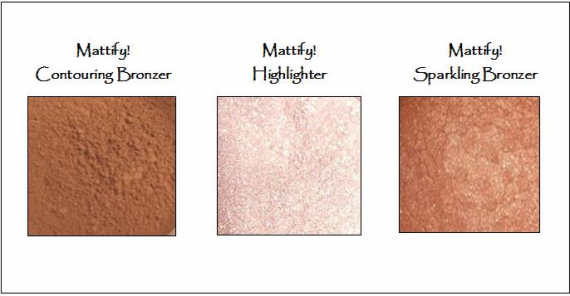 Our Highlighter can also be used alone, to create a beautiful natural glow. Check out this "yoga skin tutorial" to see how powder highlighter can amp up any natural makeup look. 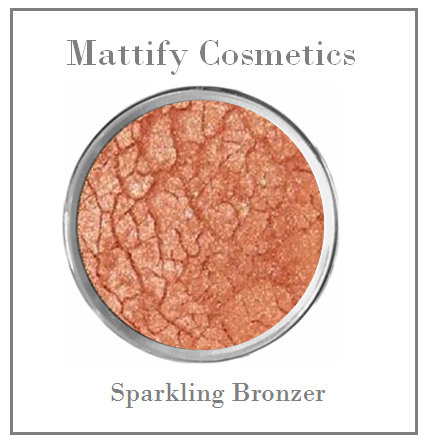 Mattify Sparkling Bronzer looks beautiful when dusted onto shoulders and decollete, to create a gorgeous faux tan. You can also try adding our Highlighter and Sparkling Bronzer to your favorite lotion for an all-over glow! Our Bronzers and Highlighters are formulated with the same oil-absorbent base as Mattify Original Loose Powder. This means they have excellent staying power, do not contain Bismuth or Talc, and help control excess oil. Get your glow on! This set of brighteners and highlighters provide an unbeatable natural glow. 1) Use Mattify’s Matte Blush on apples of cheeks to add vibrancy to your overall complexion. 2) Apply our Strobing Highlighter to upper cheekbones, center of chin, above cupid’s bow, and on center of nose. 3) Mattify's Lip Gloss Pots add barely there color with a hint of shimmer and high-gloss shine, while moisturizing jojoba & vitamin E hydrate. 4) Fields of Gold adds gorgeous sparkle to lids, while Snow Bunny brightens your entire look when used on inner corners of eyes & under brow bones. Strobing with highlighter has taken the makeup world by storm as the newest beauty trend! While it isn’t really a “new” idea (it’s simply highlighting key areas of the face without additionally using bronzer), strobing certainly gives you a vibrant natural looking glow. Looking at the map below, simply apply Mattify Highlighter to the areas in white. Strobing brightens these areas of the face, where shadows can cause the complexion to look dull. For a full description of this highlighting technique, check out the Bellatory article: Powder Highlighter for Strobing on oily skin! Using a flat powder puff, or a small tapered brush, apply our Contouring Bronzer to the brown shaded areas of the map above. 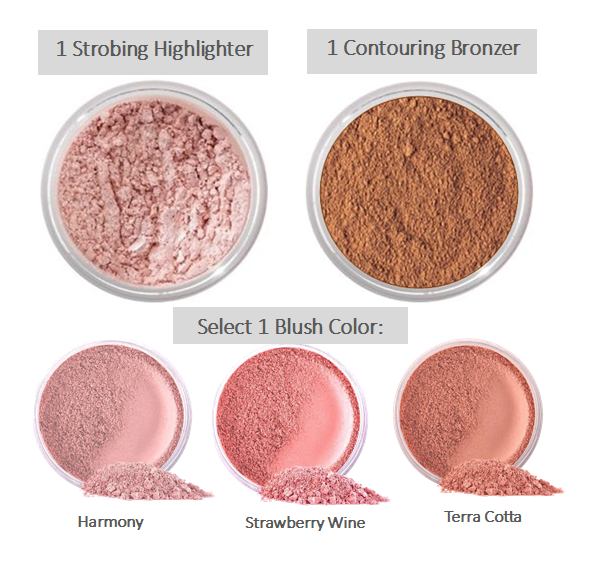 Apply our Highlighter to the white shaded areas, and our Long Lasting Blush to the pink shaded areas.